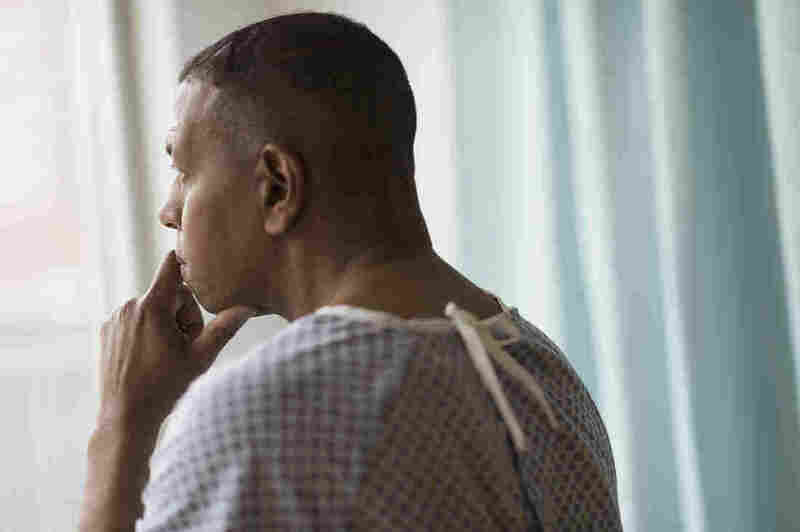 Why Black Men Are Hesitant to Participate in Prostate Cancer Research : Shots - Health News Black men are hit hardest by prostate cancer, but they are underrepresented in research. Researchers held focus groups in three states to understand why. Black men are twice as likely as whites to die from prostate cancer, one of the deadliest cancers that affect males. Prostate cancer is the most common cancer for men in the U.S.(other than non-melanoma skin cancer) and one of the most deadly. It's especially deadly for black men, who are more likely to get it and twice as likely as white men to die from it. Yet black men tend to be underrepresented in research for prostate cancer treatment. A study published Wednesday in the American Journal of Preventive Medicine captured a snapshot of the attitudes black men have regarding prostate cancer research and the evolving field of genomic testing, finding significant mistrust of the healthcare system and medical research. It builds on earlier research that has documented that African-Americans are less likely to trust clinical research than white Americans. Researchers interviewed 56 participants in seven focus groups between April, 2015, and April, 2017 to explore how black men think about participating in prostate cancer research and genomic testing. The researchers recruited focus group members in California, Minnesota, and Alabama through the meetings of 100 Black Men of America, an organization that provides educational and economic opportunities for African-Americans, and by word of mouth. All participants were over 18-years-old, and were either black men or the spouses of black men. This was a small, preliminary study. But researchers were able to glean some important themes. They found participants were largely unfamiliar with genomic testing, a promising and fairly new approach to help doctors and patients identify personalized approaches to monitoring and treating the cancer. This lack of knowledge might mean they are less inclined to pursue such novel testing. "Genomic testing is on the frontier of our new tools for managing prostate cancer," says Dr. Christopher Warlick, one of the study's authors and an associate professor of urology at University of Minnesota Medical School. Given the mistrust black men have of the medical system, he says, it's important to understand how they respond to new developments in prostate cancer research. But the most significant theme was a general distrust in the healthcare system which could suggest an unwillingness to participate in prostate cancer research. The distrust results from ways African-Americans have been historically treated by the medical system, says Dr. Charles Rogers, an assistant professor of family and preventive medicine at University of Utah School of Medicine, and the study's first author. "The biggest barrier to black men participating in prostate cancer trials stems from a lot of historical mistrust," says Rogers. Past clinical research abuses include the Tuskegee syphilis study in which black men with syphilis were unaware that they were intentionally not being treated during the 40-year span of the study, even when penicillin became an accepted treatment for syphilis. Some of the focus group participants brought up the Tuskegee syphilis study as a reason for distrusting clinical studies, which adds to previous research finding that the Tuskegee incident has led to a general distrust of clinical research and healthcare systems among African Americans. Warlick says there are a number of ways that researchers of clinical studies could mitigate this distrust. "Having more African-American researchers would be a good first step," Warlick says. Study researchers should also make an extra effort to reach out to African-American communities when recruiting participants, he says. One example of such an initiative is All of Us, a project sponsored by the National Institute of Health to recruit participants of all ethnicities to contribute their health data for use in medical studies. But despite the program's effort to partner with black faith-based groups, black participation remains a challenge, Rogers says. Warlick suggests that medical researchers could acknowledge historical events like the Tuskegee syphilis study during the recruitment process to improve transparency. Transparency of clinical research was important to some focus group participants. For example, participants wanted to know how their data collected in studies would be used. One participant told researchers he was worried it could be "used in a way that would deny you something. I think that's something that hangs over people's heads. If I'm predisposed to have cancer, would that cost me a medical coverage?" Warlick says that while it's not always possible, giving people access to their own results from research studies could be a way to establish transparency. The study authors wrote that these issues are important because they believe black men's underrepresentation in clinical research might contribute to health disparities. Dr. Otis Brawley, the chief medical and scientific officer of the American Cancer Society, who was not involved in the study, says he encourages racial diversity in research studies for "social justice reasons." He thinks it's important to have good representation of all races, classes, and genders in research because participating in clinical research can lead to improvement of care for the populations studied, and can mean doctors that participate in clinical research are more apt to deliver better care. But, Brawley says, researchers should be very careful about assuming racial difference in disease, because, he says, biology doesn't differ much by race. Brawley says African-American communities' distrust in the medical system has been well-documented beyond this study. But what this new research does show, is that there's still a lot more medical professionals can learn about the barriers minorities face to participate in clinical research studies. "The concerns of the subjects are all very reasonable, and things we need to address," Brawley says.